NOW YOU CAN BUY PASTA BY THE POUND ONLINE!!! SELECT THE PASTA SHAPE and enter the quantity of POUNDS you need, then click ADD TO CART. Repeat this and when the order is finished click on checkout and follow the steps to pay online. You can Buy FRESH PASTA ONLINE!!! We have a limited selection of fresh pasta that can be shipped straight to your home. If you want access to a wider selection of our products you can find them at most WHOLE FOODS MARKET stores in Florida, at our Factory in Sarasota, FL, at the Downtown Sarasota Farmer's Market, or the Siesta Key Farmer's Market. 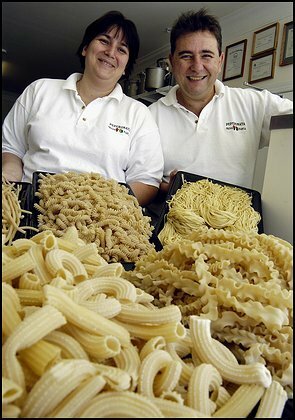 When ordering pasta online to be shipped to your house, there is a minimum requirement of one pound per shape of pasta ordered. We ship all orders using USPS Flat Rate Boxes. If you need special orders or faster shipment please call us, we may be able to accomodate your request. All orders are made fresh for your convinience, therefore please allow us up to two weeks from the time you put in your order, until it arrives at your door step. (Ex. If you put an order in on a Monday, we can process your pasta that week, and ship it the following week, therefore arriving at destination before the weekend.) If you have any questions, please don't hesitate to call us at 941-870-2729. If you need help finding your desired shapes please click here.